In this post, you will learn a good trick/way to restrict or disable or stop background data usage on your android phone, so as not to waste unnecessary data, and saving some cash at the end of the month, and as well your battery. However, there are some apps such as Gmail which would provide you with the option to limiting the frequency at which they consume data by configuring it to update your email at desired regular intervals, but as this might not go down well with some, or you wish to stop some apps like Facebook where this option is not found, disabling background usage of data is key. Now only would the internet bills keep piling up if you do nothing and your battery as well gets drained. Note: As at the time of publishing this post, this method works on Android 4.0 JellyBean, and above. 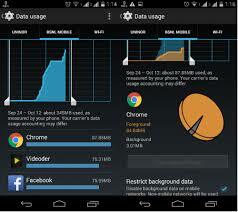 Below is a simple guide on how you can restrict background data usage on your android device. Step 3: Now tap on the three vertical dots to the top or down right side and select Restrict Background Data, i.e if you want to restrict all apps on your phone. Step 4: If you want to select apps to restrict, after step 2, scroll up and select the app you wish to restrict Background Data, tap on the three vertical dots to the top or down right side and select Restrict Background Data. It’s as easy as that, you’ve successfully disabled background data usage on your android device. Are there any other methods you wish to share with other readers? Let us know via the comments box below.